The Students for Concealed Carry on Campus Board of Directors is pleased to announce that for all of empty holder protest week (Now – April 10 @ 11:59 PM ET), there is an opportunity for anyone with a .edu email address to obtain a FREE CHP TRAINING COURSE for Virginia. Both residential and non-residential permits are available in Virginia. Online training is valid under Virginia law for a Virginia CHP permit (VA Code §18.2-308 (G)(7) and (P1)(7)). Education and training are key goals of SCCC. By making training available to students, faculty, and staff on campus, we will further a goal shared by both sides of the gun rights debate: to educate about the core safety aspects of firearms and self-defense. 4) Finish the course before April 10 @ 11:59 PM ET. Upon completion of the course, you will be given a printable certificate of completion. Instructions on how to submit this certificate to Virginia authorities is available at: http://www.vsp.state.va.us/Firearms.shtm . Please note that you will be responsible for any state fee(s) and compliance with all legal standards that Virginia requires. A Virginia CHP permit is currently valid in AK, AR, AZ, DE, FL, ID, IN, KY, LA, MI, MO, MS, MT, NC, ND, NE, NM, OH, OK, PA, SC, SD, TN, TX, UT, VT, and WV. Please note however that currently Michigan (MI), South Carolina (SC), and Florida (FL) only honor permits from residents of the issuing states. Sounds like a great opportunity. By the sounds of it, you don’t even need to live in Virginia to take advantage of the offer, since non-residential permits are available. All you need is an .edu email address. I encourage all students, faculty, and staff of colleges and universities to take advantage of this offer. I applaud Students for Concealed Carry on Campus for making this happen, and wholeheartedly support their cause. Remember you only have until Midnight until April 10th, if you want it for free. 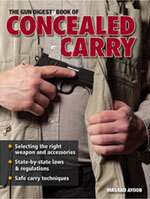 As always, I recommend the book by Massad Ayoob (pictured left) for anyone that wants to read up on concealed carry.